Would you believe Kathy and I have been back and moved into our new apartment for over a week now and I just tonight set up my computer? I really just had nowhere to put it. Now that we're starting to get some things settled into place I cleared out a corner of our second bedroom to use for a workspace. Problem was, I didn't have a desk. What to do? Why, build a desk of course. 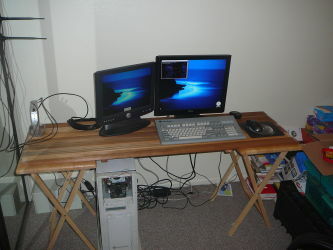 This temporary desk is made out of two tray tables and seven redwood slats that had been used in the bed I built several years ago. I had a couple little pieces of scrapwood lying around from furniture that had been delivered, so I fastened two bottom pieces to keep the slats from sliding apart. Eventually I'll want something better (and want the tray tables back), but this'll certainly do for now.